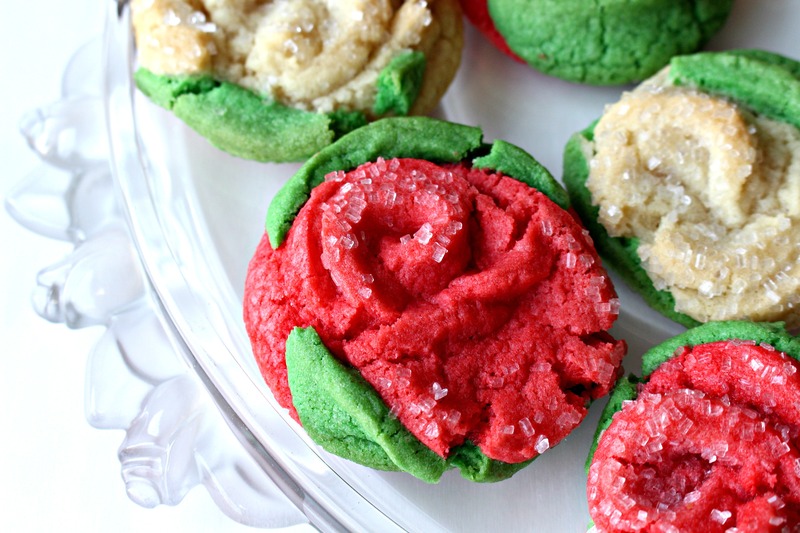 Sugar Cookie Roses are the final addition to a week of Time Saver Recipes. Like the other 6 recipes, this one uses a shortcut ingredient to speed up preparation time. 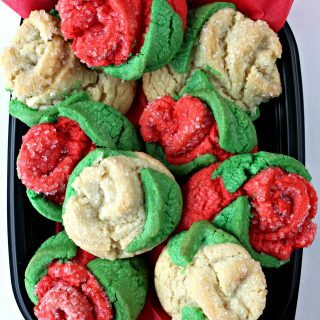 Sugar Cookie Roses are made with a roll of refrigerated sugar cookie dough and a little flour to thicken the dough for rolling out. A bit of extract adds flavor and a few drops of food coloring turns plain dough into flowers. This is an edible craft project. Making the Time Saver dough takes just a few minutes. Creating and baking the flowers takes approximately 1- 1 ½ hours. The dough is easy to work with and doesn’t require any chilling time** (see below). After experimenting with a few different approaches, the process photos and recipe describe what I found to be the easiest and fastest method. 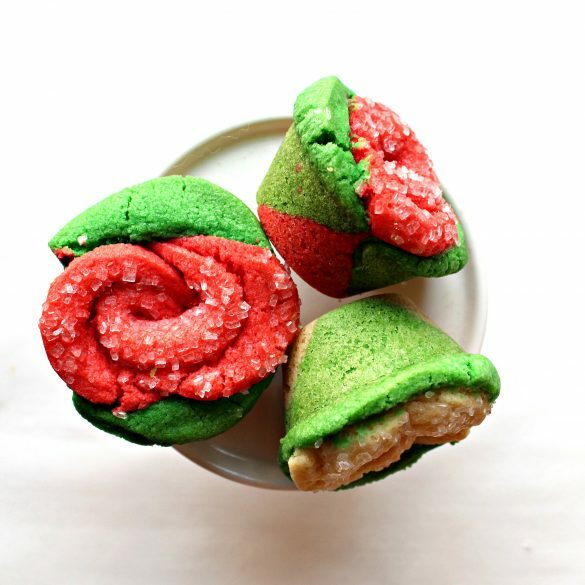 Pinterest is full of beautiful rose shaped baked food. 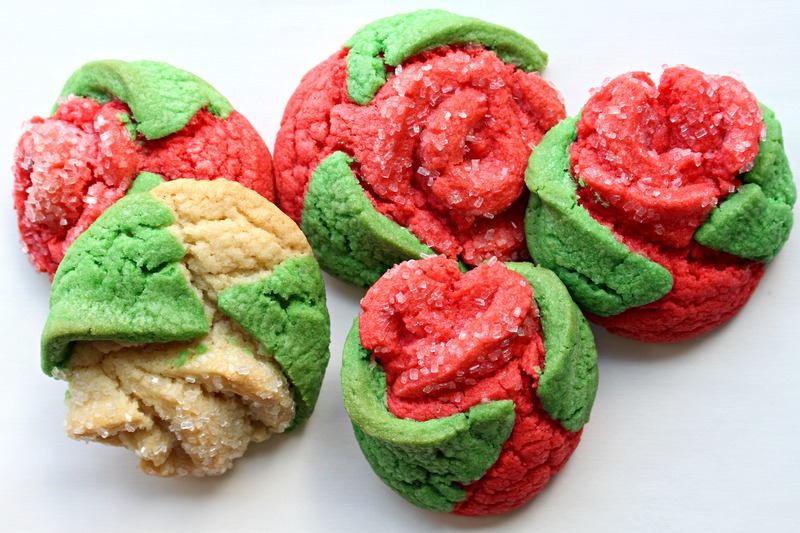 I’ve seen apples, potatoes, breads, and pie crust turned into roses, but I couldn’t find Sugar Cookie Roses. Armed with 4 rolls of cookie dough (for failure insurance) I played with a few variables on my way to this recipe. The first thing I tackled was texture. Refrigerated cookie dough used to be less mushy. It was meant to be sliced, now it is meant to be spooned. I added flour to create a roll-out consistency. Though I added as little flour as possible, the flavor of the cookies was effected. Adding a bit more flavoring took care of that. I used citrus flavoring in this cookie (fiori di sicilia or orange), but vanilla, almond, or anise would be good choices too. Once the recipe was figured out, I experimented with baking methods. I tried baking the rolled up roses on a baking sheet and in a mini-cupcake pan. My final choice was to stick with the baking pan, but the mini-cupcake pan could also potentially work. The rose shaped cookie cups from the cupcake pan are cute and pretty, but the thickness makes them difficult to eat as they become crunchier during longer storage. If the cookie cups will be eaten within 2-3 days, baking in a mini-cupcake pan is an option. I also experimented with chilling the dough flowers before baking, in an attempt to get more defined petals. Chilling seems to produce a slightly different shape, but not more defined petals. The roses made from chilled dough flop over during baking and end up looking like a bud or a rose on its side. The roses made from unchilled dough most often settled downward during baking, producing what looks like an open rose seen from above. Though both shapes are pretty, I prefer to go with less time and skip the chilling. Everyone needs some roses in their life, especially if they are cookies. 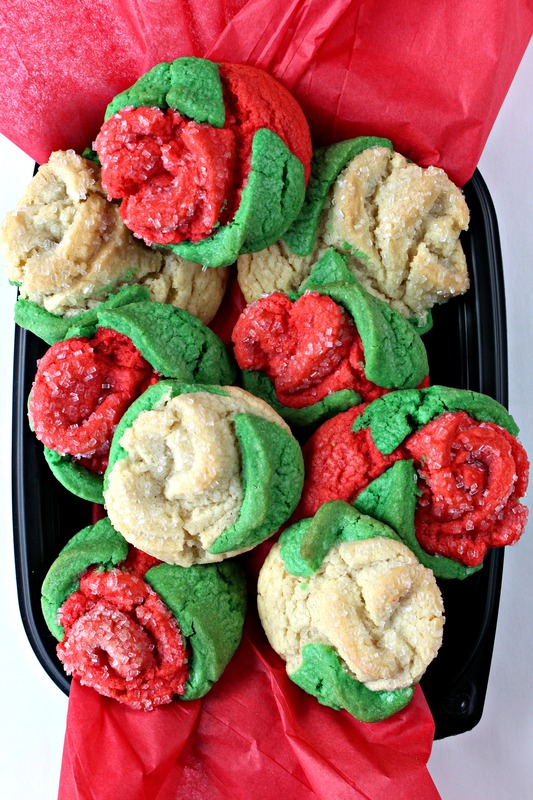 These Sugar Cookie Roses won’t wilt on a cookie platter, in a gift bag, or in a care package. But once you taste them, they will disappear quickly! I hope you have found a few Time Saver Recipes to make baking and gifting just a little less stressful and a whole lot delicious! 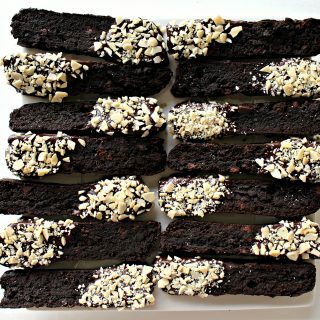 In addition to Sugar Cookie Roses, the other Time Saver Recipes in this series include Chocolate Covered Cherry Bars, Cinnamon Chip Biscotti, Gingerbread Spice Cookies, Butterscotch Blondie Bars, Peppermint Crunch Cookies, and Mocha White Chocolate Biscotti. 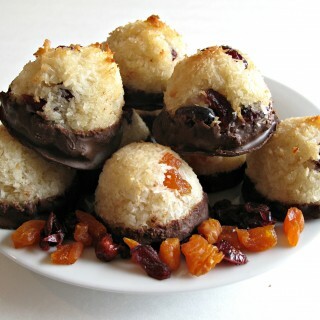 In the bowl of an electric mixer, beat cookie dough and flour until a dough ball forms (1-2 minutes). Divide the dough into thirds. Leave one of the portions white. Add 2-3 drops of red food coloring to one of the dough portions and knead until color is uniform. Add 2-3 drops of green food coloring to the remaining dough portion and knead until color is uniform. Keep dough balls wrapped in plastic wrap until ready to use. Roll out the white dough to 1/8” thickness, between two sheets of parchment paper. Cut out circles with a 2”-2 1/2” cookie cutter. Repeat rolling and cutting out circles to use up the white dough. With a sheet of wax paper or parchment paper on the work surface, arrange three dough circles in a vertical row, with edges overlapping slightly. Starting at the top, roll the circles down into a cylinder, pinching the center gently as you roll to close any dough cracks. Use a knife to cut the cylinder in half. Gently dip the un-cut (rose petal) ends in sparkling sugar, then place the dough rolls, cut edge down, on the prepared baking sheet 3” apart. Repeat with remaining white dough circles. 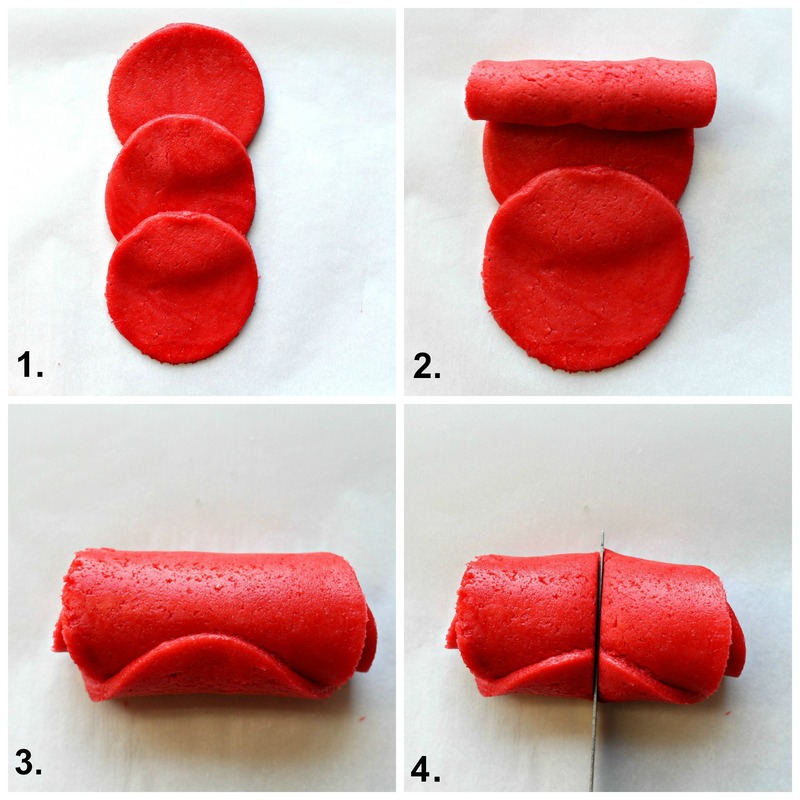 Roll and cut out the red dough, and repeat the rolling/cutting process. Roll out the green dough and cut out circles. Cut each circle into fourths. Press two pieces of the cut green circle leaves onto each rose cylinder. Bake 1 baking sheet at a time for 15-16 minutes. Remove from oven and allow to cool on baking sheet for 5-10 minutes. Transfer cookies to wire racks to cool completely. Wraps pairs of cookies, bottoms together, in plastic wrap. Stack bundled cookies in an airtight container or freezer weight ziplock bag. WOW… you know you just never cease to amaze me !! this is so pretty …. and you’ve made them so easy to make. I must say that this is the first place I come when I want cookies…. never disappointed ! You truly are gifted and nope mine don’t always look as pretty as yours, but someday…LOL… for now I just have fun trying & of course eating… so far they’ve all been a big hit. Thank you, Abby, for your very kind words! I love that you are having fun playing with baking! For me, baking has a lot of learning involved. It’s not like regular cooking where you can kind of wing it. Baking is all chemistry. Then there is decorating. Honestly, for every cookie design that makes it to The Monday Box there are at least that many ideas that just didn’t translate from my head to the cookie. 🙂 (My family gets to eat all of the “ugly” cookies.) But as you said, it’s all about having fun trying and celebrating the ideas that do work! Knowing that the cookies are being enjoyed by readers like you, and by our troops, is the best motivation there is! What a smart series this has been, Wendy. Since you save time making the dough, it leaves you time to play with the shaping to get these beautiful roses. You did a great job experimenting and the results turned out so nice! This would be a great gift for Valentine’s Day, too. I just don’t know if I’d be able to make mine so nice. Thank you, Monica! These roses were especially fun to make. I guarantee yours would be at least as nice as these, probably better! It doesn’t just look easy, it really is! I agree that these roses would be great for Valentine’s Day! Crafting with cookie dough is my kind of crafting! These are so sweet. I really loved the whole time saver series. Great idea. Thanks, Cindy! Though you and I find cooking and baking to be relaxing and a creative outlet, many get stressed out at the thought of baking. Hopefully, the time saver series recipes will reduce some of that “fear of the unknown” stress. Wendy, these are GORGEOUS! I am definitely going to make some of these but I think I’ll skip the refrigerated dough and make my own. These are adorable and I love that it’s a time-saver recipe. I can see making these for watching the Rose Bowl Parade. Thanks for sharing at the #ThisIsHowWeRoll Link Party. Pinning now. Thank you, Susan! The roses are so easy to make and would work for all kinds of occasions. I love your idea of making them to eat while watching the Rose Bowl Parade! I have Valentine’s Day plans for these cookies. 🙂 Thank you for hosting and for pinning!! Beautiful Cookie Roses and thanks so much for the tutorial, you make it look so easy! Thanks so much for sharing your awesome post with us at Full Plate Thursday. Hope you are having a great day and come back soon! Thank you, Joyce for your kind words and for hosting Funtastic Friday! Oh my goodness these are beautiful! And much easier than I anticipated at first glance. Thanks, Erin! I love things that look like you worked on them forever, but are really quite simple! 🙂 These are an easy cookie, but everyone is amazed! I have to agree that everyone needs roses in their life. These cookies are a work of art and are definitely great for Valentines Day! Wow! What beautiful cookies! I’ve never seen anything like them and they look almost too pretty to eat! I love this idea and your detailed instructions and photos make it look really easy to make these cookies! Thank you so much for sharing! Thanks, Sharon! I hope the instructions show how easy these Time Saver cookies are to make. Sometimes people connect pretty with difficult, but these roses are super simple and quick! You are.. so.. FANCY. These are so cool! It reminds me of playing with play dough.. I’m not sure I could bring myself to eat them though! Thank you, Sarah! The trick is that these cookies look fancy but are super simple to create, especially if you use prepared refrigerator cookie dough! 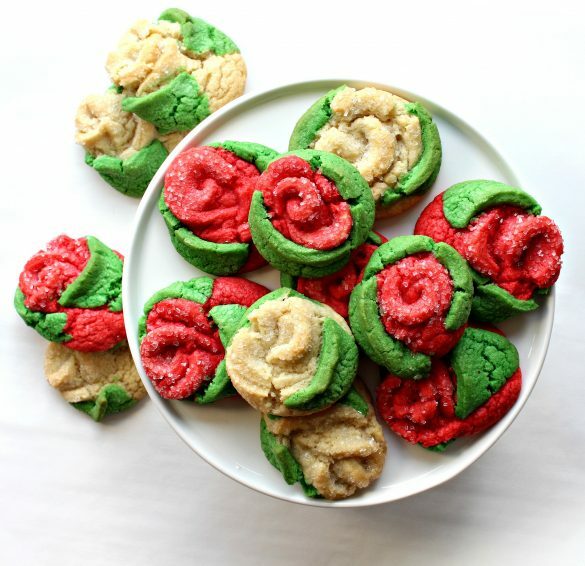 Wow, these cookie roses look so beautiful. I’m really impressed with your handcrafting skills. I must admit, I have no patience for making such fine things but wouldn’t mind receiving a box of these cookies as a gift 🙂 These cookies are gorgeous. Thank you, Natalie! I admit, a drop cookie or cookie bar is quicker. However, these roses are very simple and require little patience or handcrafting skills! I promise! 🙂 They are part of a Time Saver series of recipes that cuts out time by using purchased cookie dough. What an adorable idea!! 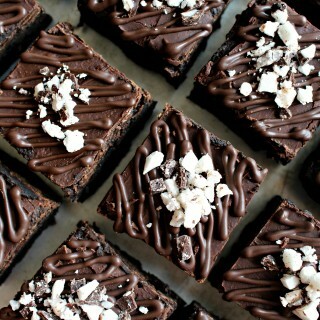 I would love to get a box of these instead of chocolates. And I must admit that Fiori di Sicilia is a great flavoring, I use it with my Italian sweet breads. I wonder how this would work with the box sugar cookie mix? OMG these are so pretty. Perfect for Valentine’s Day or any special celebration. Takes cookies to a whole new level. What a great recipe. Thank you, Gloria! 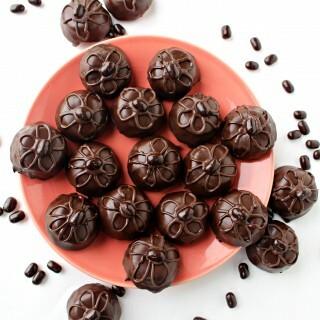 A few minutes playing with pre-made dough and you have a bouquet for any occasion! These are lovely, and so creative! They’d be perfect for Valentine’s Day!! Wowza! I am totally impressed with this! I am glad that you can use store-bought dough as well for convenience. Certainly, a must-try! Pinned. Thanks so much, Abigail! Though these can be made with any cookie dough that is stiff enough to hold it’s shape, using a store-bought dough is a real time saver! Wow, these are absolutely gorgeous. I think I would feel guilty eating them…but only for a second. Not only are they pretty but they look delicious too! I’d rather have these than real flowers any day! Thank you, Megan! 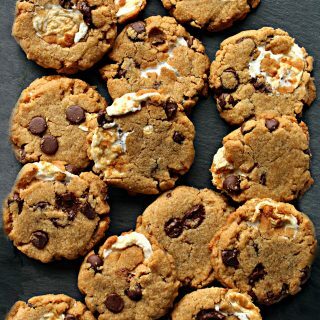 These cookies are a real show-stopper, but are so easy to make! I am showing this to my boys and husband and going to hint them that this is what I would like for Valentine’s day. On second thought this would be a fun project for me and the boys to do together. Thanks for the detailed instructions. These are by far the most beautiful cookies that I have seen. Thank you so much, Sandhya! Whether you make these with your boys or received them for Mother’s Day, I hope they are delicious and fun!! This is such a fun idea, and they are just perfect for Valentine’s day! I love this, and can’t wait to make them! Thank you, Leah! I hope you enjoy them! 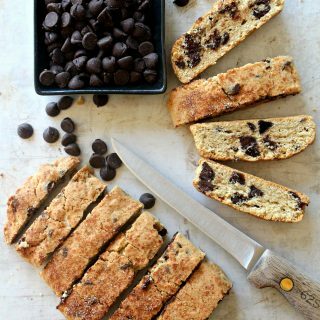 I’d never think about adding flour to cookie dough to turn it into roll out cookies! I love making roll out cookies from scratch, but this is such a great time saver for those who aren’t into scratch baking. Brilliant! The roses are gorgeous – so creative! Thanks, Kylee! I hope they turned out great and that you and your kids had fun baking! I’m always doing for cookies, especially when they look this pretty! Also, this gives me a reason to make sugar cookies again even though I vowed to give them a rest after the holidays ? These are beautiful! Thanks for sharing at the What’s for Dinner party! I LOVE these! Valentine’s Day is just around the corner, and these would make sweet Valentines! Thank you for sharing!! So pretty. Perfect for Valentine’s Day. Found you on Reader Tip Tuesday. Thank you, Amy! I’m glad you found me! 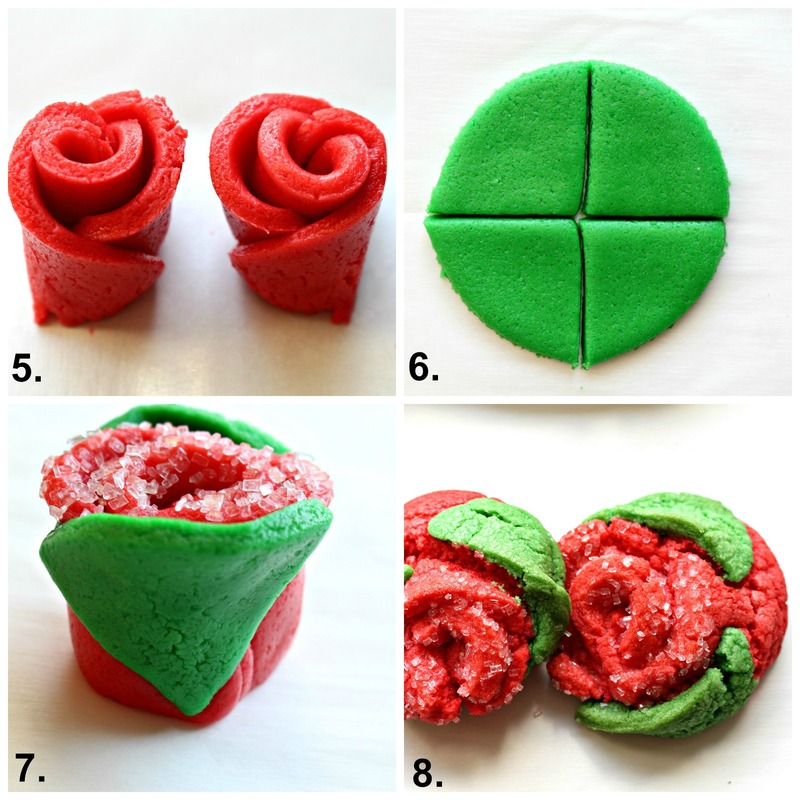 I love that these roses look like they take a lot of time but actually are easy with refrigerator dough and no extra decorating! What a clever and beautiful idea, Wendy! Love that this uses ready made dough! Pinning and sharing on the H&S Facebook page. Thank you for sharing, and for being a part of the Hearth and Soul Link Party. Hope you have a lovely weekend! Well first the cookies are amazing, I have never seen rose cookie and the color is great!! Your tutorial is also great and using refrigerator dough sure cuts down time. 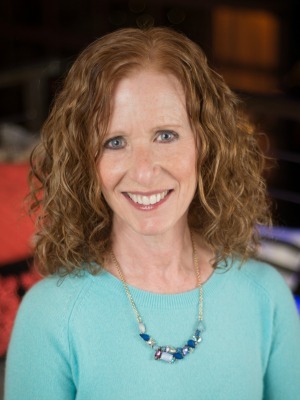 Thank you Wendy for sharing on #omhgff this week! Thank you, Karren! I was so pleased that these roses came out just like I imagined. The refrigerator dough is a great time saver! Thanks for hosting #omhgff !